Do Not Sell At Any Price: The Wild, Obsessive Hunt for the World’s Rarest 78rpm Records (Scribner, $25) is not, of course, a book about books, but it is a book about collecting, which is why it made our list of “7 Summer Reads.” The author, music critic Amanda Petrusich, delves into the underworld of quirky collectors, an “oddball fraternity of men” who scour flea markets and estate sales looking for backwoods blues artists released in small batches on 78s in the 1920s and 30s. It’s a fun and often funny book, and one that will inspire a feeling of familiarity among bibliophiles--Petrusich herself admits to her childhood predilection for perfectly lined up spines of her paperback collection. The book is about the “lure of objects,” as she puts it, and the preservation and veneration of those objects. Petrusich may be bitten by the collecting bug, and thus as vulnerable to its neuroses as the rest of us, but she ably unpacks these record collections as cultural documents, particularly in the case of 78s when so much of the music lay undiscovered for so long, with records so rare only one or two copies exist. Unlike later vinyl, 78s leave no masters behind, which means the brittle disks themselves are what’s left of the recording sessions. Bibliophiles generally have to reach much further back to find that combination of original material and incredible rarity, but reading this did bring to mind the zines of the late 80s/90s. Created in small editions, quickly outdated by technology, and largely forgotten until collectors and archivists began to see their documentary value. Do Not Sell is full of strange, even beautiful, tales of obsession. For example, she interviews a collector plagued by dreams that he has finally found a 78 of Skip James’s “Devil Got My Woman.” The book’s title comes from a neat anecdote of seeing two 78s, now in two different collections, each bearing a sticker that proclaims, “Do Not Sell At Any Price.” Petrusich writes, “I was subsumed by a strange gratitude, just then, for that faceless person and his little white stickers, for his vehemence, for this commitment to music as a thing to work for and revere and treasure and save, till death do you part.” But perhaps the most entertaining story is Petrusich’s own--when she scuba-dives into the muddy Milwaukee River hoping to discover a treasure of shiny shellac long ago flung into the river by Paramount factory workers. Even someone who knows little or nothing about 78s will find Petrusich’s book an incredibly enjoyable read. An excerpt is available here. 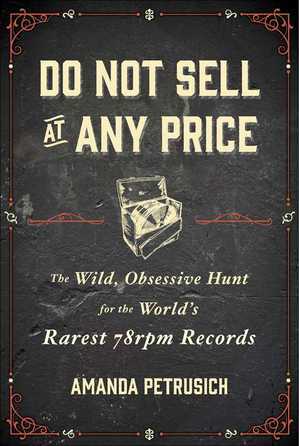 Do Not Sell At Any Price: The Wild, Obsessive Hunt for the World's Rarest 78rpm Records (Scribner, $25) is not, of course, a book about books, but it is a book about collecting, which is why it made our list of "7 Summer Reads." The author, music critic Amanda Petrusich, delves into the underworld of quirky collectors, an "oddball fraternity of men" who scour flea markets and estate sales looking for backwoods blues artists released in small batches on 78s in the 1920s and 30s. It's a fun and often funny book, and one that will inspire a feeling of familiarity among bibliophiles--Petrusich herself admits to her childhood predilection for perfectly lined up spines of her paperback collection. The book is about the "lure of objects," as she puts it, and the preservation and veneration of those objects. Petrusich may be bitten by the collecting bug, and thus as vulnerable to its neuroses as the rest of us, but she ably unpacks these record collections as cultural documents, particularly in the case of 78s when so much of the music lay undiscovered for so long, with records so rare only one or two copies exist. Unlike later vinyl, 78s leave no masters behind, which means the brittle disks themselves are what's left of the recording sessions. Bibliophiles generally have to reach much further back to find that combination of original material and incredible rarity, but reading this did bring to mind the zines of the late 80s/90s. Created in small editions, quickly outdated by technology, and largely forgotten until collectors and archivists began to see their documentary value. Do Not Sell is full of strange, even beautiful, tales of obsession. For example, she interviews a collector plagued by dreams that he has finally found a 78 of Skip James's "Devil Got My Woman." The book's title comes from a neat anecdote of seeing two 78s, now in two different collections, each bearing a sticker that proclaims, "Do Not Sell At Any Price." Petrusich writes, "I was subsumed by a strange gratitude, just then, for that faceless person and his little white stickers, for his vehemence, for this commitment to music as a thing to work for and revere and treasure and save, till death do you part." But perhaps the most entertaining story is Petrusich's own--when she scuba-dives into the muddy Milwaukee River hoping to discover a treasure of shiny shellac long ago flung into the river by Paramount factory workers. Even someone who knows little or nothing about 78s will find Petrusich's book an incredibly enjoyable read. An excerpt is available here.